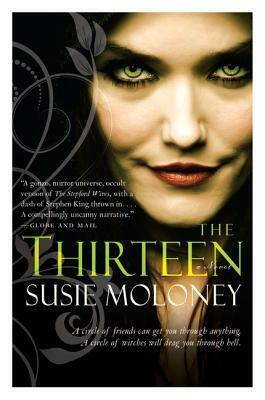 The Thirteen is set in a seemingly quiet neighbourhood ,in a modern subdivision, with underlying evil. This story revolves around the old Mephistopheles concept of selling one’s soul to the devil for something greatly coveted. Paula Wittman returns to Haven Wood after a thirteen year absence with her twelve year old daughter Rowan. She has been summoned to her childhood home by Izzy, her mother’s old friend. Paula thinks that she is coming back to the suburb of her youth with quiet ,safe streets, zero crime, and friendly neighbours, but soon realizes that her terrified , and very ill mother, does not want her there. She is being cared for in a deserted hospital, overseen by a strange nurse, and no doctor available to speak with about her mother’s weird condition. Unbeknown to Paula …Izzy ,the leader of a coven of witches, is trying to recruit her. The coven need to bring their count back up to the required number of“thirteen”.This group will do anything to make their dreams come true, including blood sacrifices, and demon worship, among other pastimes. The consequences of their attempts to ensnare others reliably rebound onto themselves. The scary stuff is really creepy, but the author also captures the desperation of poverty, family obligations, and parental anxiety for their children. Within the story a healthy romance blooms between Paula and an old schoolmate which adds a sprinkle of normalcy. At times the author uses line breaks in the prose and inserts thoughts , which draws the reader in, and gives a haunting feeling to the writing. The story is laced with mystery, humour, witchcraft, and terrifying family dynamics. Overall it is a good read, especially for people who enjoy horror novels. Stories in the North will be hosting Susie Moloney on Saturday May 4th, 2013 for a day of workshops and an evening performance of her work.